Andy Mossack, a well-known British travel writer and the creator and presenter of BBC Radio’s “Where in the World is Andy” travelogue series, suggests some things to see and do in Riga, Latvia on a weekend visit. Be sure to check back in for other insightful reviews from Andy’s travel exploits. Riga, Latvia, is a walking city that is just the right size for a weekend break, and the old town, which has now been fully restored to its former colorful glory, contains many hidden gems that you’ll stumble across when you explore all its little winding back streets. When you step out into Old Riga, you’re transported back to the Middle Ages where, trapped inside the city walls, the town had to grow organically into tightly knit cobbled streets going off in all directions. Exploring the old town, I found open squares lined with cafés, plenty of old Germanic merchants’ houses, and some magnificent churches with those great onion-domes that are so eastern Europe — one of which contains the second largest pipe organ in the country. However the centerpiece of Old Riga is the town square with its fine guild halls, including the restored House of Blackheads and its magnificent Dutch Renaissance façade. Stroll, stop, and even have a drink or two, and along the way you’ll make friends with real pieces of history. Latvians have had a tough history, having had as many conquerors as hot dinners (including the Red Army twice). You wouldn’t expect much in the way of friendliness, but surprisingly there is no shortage of it. In fact, if you are to understand anything about Riga and its people you have to put a visit to The Museum of the Occupations at the top of your “to do” list. Incredibly, the Nazis were seen as liberators when they first marched into Riga in 1941 – freeing the city from the oppressive Red Army who had terrorized the country and sent many of the population to gulags. Of course it then turned out the so called liberators were just as bad — one in ten Latvians were murdered. Others were conscripted into the German army to fight against the Russians, and more than 25,000 Jews were murdered in Rumbula Forest just on the outskirts of the city, where today the site is a very moving memorial. That was until 1944 when the Russians came storming back, kicked out the Germans and seemingly made up for lost time by sending hundreds of thousands of Latvian “Nazi collaborators” to Siberia. The museum captures all this and lays it out in an easy to understand way. Once you realize the struggle these people had, you really appreciate just what freedom and independence really means to Latvians today, and why they revel in rejoicing at any opportunity. Expect to see plenty of outdoor concerts, lots of communal hugging and a warm welcome from anyone you meet. 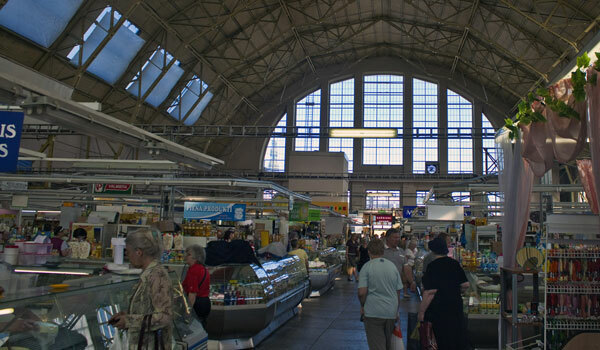 The Central Market, once a hangar for five enormous WW1 Zeppelins, now houses Europe’s largest food market and bazaar. Each of the five hangars has a different specialty – such as meat, fish, groceries and dairy products – and the atmosphere hasn’t changed much since it opened. Fresh caviar can be cheaper than chips, just grab what you want and haggle like mad! After some successful negotiating, take a lunch break and sample a must-have food in Riga: black rye bread, or rupjmaize. This handmade bread has a taste and texture unlike any other rye breads you’ve had before. Its strong taste, high nutritional value and almost miraculous ability to stay fresh is achieved through a long and painstaking process using natural malt. Take a short ride to the northwest corner of Riga and visit another piece of history, the abandoned Spilve Airport that was in heavy use during Soviet times. The main terminal building still bears the hammer and sickle on the front façade, another grim reminder that it was only seventeen years ago that the Soviets moved out. After all this appetite-building exercise, finding good places to eat in Riga is about as difficult as boiling a kettle. A good example is The Black Monk (In Latvian: Melnie Muki, Address: Jana Seta 1, Phone: +371 7215006), one of Riga’s most popular restaurants. This outstanding restaurant is built from an ancient cloister near the old city walls, and from a former presidential chef, delivers the kind of quality you would have to book weeks ahead for in a comparable London restaurant. Beautiful dishes from an extensive menu are paired with wine at prices that are almost too low to believe. The Daugava River splits the city, and although there are plenty of boat rides available, it’s not a trip laden with great architectural sights, so one to be avoided at all costs, unless you find a vista of shipyards stimulating! The modern section of Riga is all hustle and bustle and contains everything you would expect from a busy city slowly coming to terms with finally having an independent lifestyle. And like all quiet revolutions, it’s the young people who are making the difference with bars, clubs, music and fashion. Riga will excite you, and certainly give you a taste for discovering more about the Baltics, just a stone’s throw from the Russian border. How To Get There: Riga International Airport (RIX) is less than 10 miles from from downtown. Direct flights are available from 80 cities. Travelers can get to the city center from the airport by taxi in about 15-20 minutes (costs about 10 lats) or by bus in about 30 minutes (costs about 0.50 lats). Best Time To Visit: Like most European cities, peak season in Riga is April – September. Visiting in the late fall or winter means lower prices and fewer tourists. Riga is also known for its charming Christmas markets.